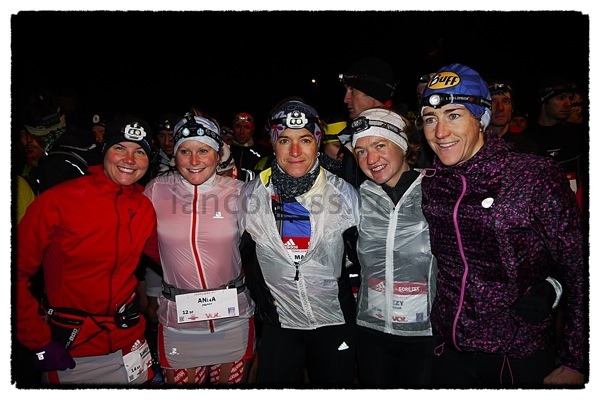 After a light dusting of snow during the night, runners for the 18th edition of La Course des Templiers had the prospect of a very cold day on the trails. With a temperature range of -3-4 deg and a very strong wind, cold was going to be a major issue. On the start line runners assembled dressed for cold weather and believe me, they got it! Although the ambient temperature rose above 0 deg’s the general feel was considerably colder. 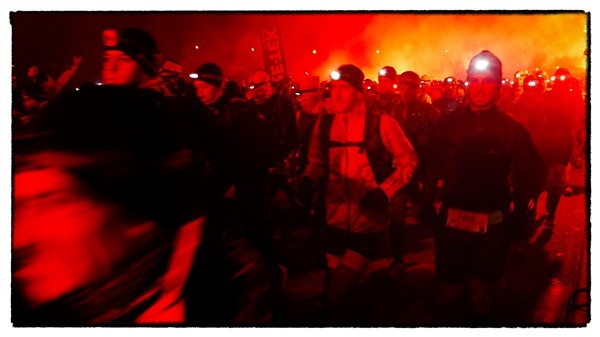 Stirring music, red flares and the runners left Millau at 0515 for 70+ km’s on trails. Prior to the race we had a stacked field of runners but due to a string of late season injuries, several key runners were unable to run. Notably Leadville 100 winner Thomas Lorblanchet and Philipp Reiter. UTMB winner, Francois d’Haene although carrying a knee problem decided to make the start however dropped early in the race. In the ladies race the notable drop before the race was Francesca Canepa who had started the Endurance Trail (102k) on Friday and stopped midway. For some reason she had planned to run ‘both’ races over the weekend! Anna Frost had been injured since Cavalls del Vent and was 50/50 but after having a short test run the day before. She ‘taped’ her legs considerably prior to the start and like the true competitor she toed the line see how things would go… after all, she was joint leader with Nuria Picas of the Ultra Skyrunning series and ‘Templiers’ would decide the champion. Maud Gobert and Emelie Forsberg set the early pace followed by Lizzy Hawker. Nuria running from behind, caught Lizzy and passed her and then pursued the front-runners. Once Nuria caught them she pulled away taking Emelie with her. 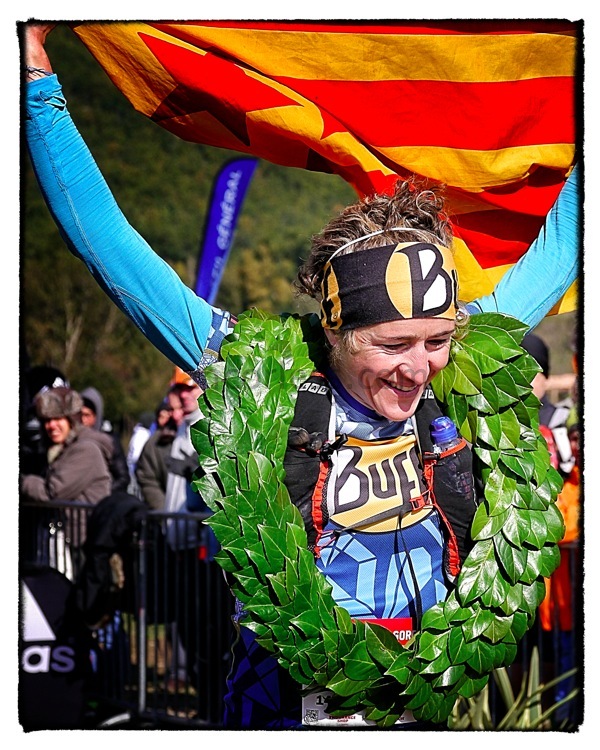 One has to say that if anybody deserved the ‘Champion’ title it is Nuria… she has consistently performed well throughout 2012 not only in the ultra series but Skymarathon and Vertical K. Nuria eventually pulled away from Emelie leaving her being pursued by Maud and Lizzy. Between 22k and 35k Lizzy caught and passed Maud. Emelie Forsberg now chasing Nuria was caught by Lizzy who rallied. With Nuria crossing the line as race winner with a comfortable margin of almost 10 minutes, a race really was coming together for the 2nd place. In the end it came down to a sprint finish with Emelie just pulling away from Lizzy to beat her by 9 seconds. Without doubt it was a ‘royal’ podium. Emelie was only recently crowned world Skyrunning champion at Kinabalu and Lizzy Hawker has just had a golden patch with three superb wins at the shortened UTMB, Run Rabbit Run 100 and Spartathlon. The men’s race had a clear favourite with last year’s winner; Andy Symonds. However he had a race in front of him. Julien Rancon was an early protagonist and eventually forged ahead of the race with Fabien Antolinos, Miguel Heras and Andy Symonds in pursuit. Julien has had a very successful 2012 with 7 races and 7 victories but no race had been longer than 60k. With just over 10k to go, Julien Rancon had a 45 seconds lead over Fabien Antolinos and 1 minute over Miguel Heras. 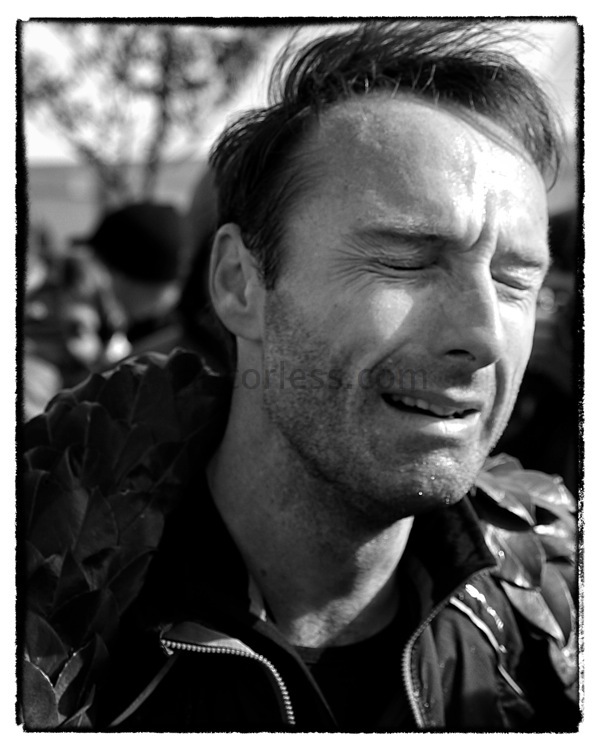 As I waited at the finish news came in that Fabien Antolinos had dropped; a real shock at such a late stage of the race. This left the door open for Fabien Antolinos to surge away from Miguel Heras. He crossed the line in an emotional state. 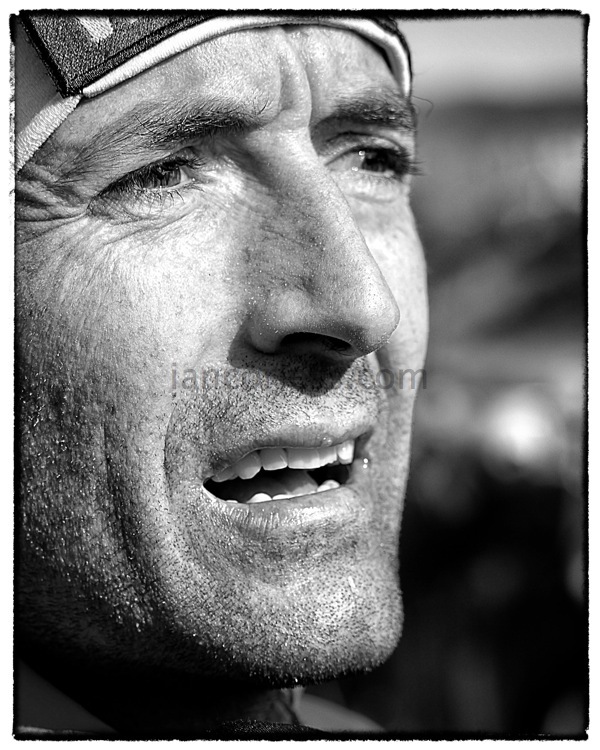 Tears in his eyes… he had run Templiers only the previous year and placed 4th. This was a sweet victory. Miguel Heras placed 2nd just over 3 min later and put to bed a mixed season. Andy Symonds ran into the finish with a massive smile and took an opportunity to dive into a pool of mud just before the finish line much to the satisfaction of the ground. Andy has become very much a hero in France. His win last year at Templiers cemented this. 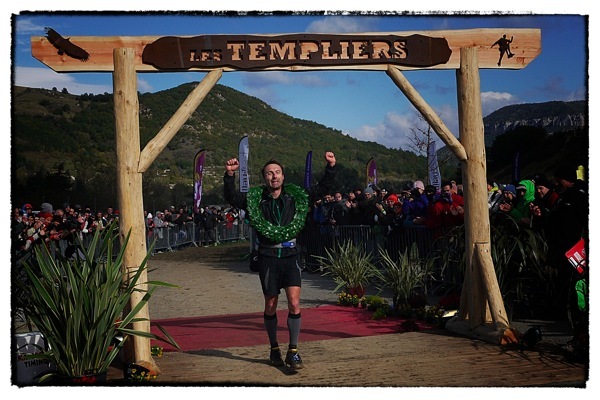 La Course des Templiers was the last race in the Ultra Skyrunning series and as such a final presentation was made. 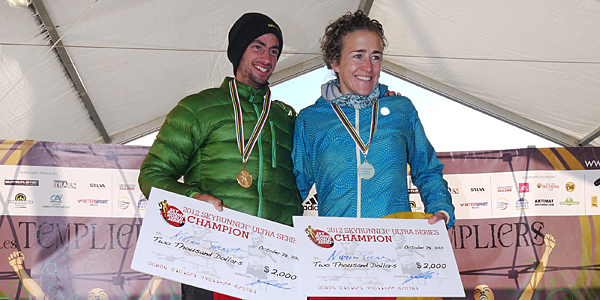 Kilian Jornet and Nuria Picas stood on the podium to receive the respective awards from ISF President Marino Giacometti. Two great champions! To add to that magical ambiance, it helps to know that Nant was one of many points in a network of secret trails built by the Knights Templar, the monastic, international military order formed at the end of the First Crusade with the mandate of protecting Christian pilgrims traveling to Jerusalem. The Knights Templar, known for their architectural skills and fighting alongside Richard I were the first warrior monks and were prevalent in that part of France until their downfall in 1307. 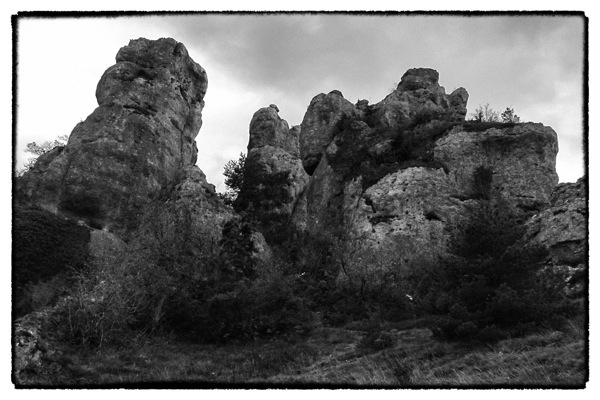 The race route uses the secret paths of the Templars. It has included two long tunnels that had been used as shortcuts to beat enemies to strategic locations. The region has become a popular tourist attraction primarily due to the success of Dan Brown’s The Da Vinci Code. Key points on the course are the old village of Peyreleau, Route Alleyral, St Jean des Balmes, Roquesaltes (a protected site and an usual stone structure with a protected arch), the old castle of Montmejan, old cobbled streets of La Roque Ste Marguerite and Massebiau that has an old bridge. This entry was posted in Uncategorized and tagged Andy Symonds, Anna Frost, Aveyron, Cote de Massebiau-Le Cade, Cote de Peyreleau, Cote de Pierrefiche, Cotes de Carbassaa, Emelie Forsberg, Fabien Antolinus, festivaldestempliers, France, Frosty, ISF, la course des templiers, La Roque Ste Marguerite, Les Templiers, Lizzy Hawker, Marino Giacometti, Massebiau, Maud Gobert, Miguel Heras, Millau, Montmejan, Nuria Picas, Peyreleau, Roquesaltes, Route Alleyral, Salomon Running, Skyrunning, St Jean des Balmes, trail, Ultra by talkultra. Bookmark the permalink.